Medford-Peden Funeral Home & Crematory is independently owned and operated with a staff of licensed Funeral Directors and Embalmers serving Historical Marietta, Georgia and the surrounding Atlanta area with personalized service since 1969. We specialize in Funeral planning that is compatible with the beliefs and traditions of each family we care for. With a showroom of beautiful caskets, as well as a cremation facility on the premises, we can cater to all of your Funeral planning needs with personalized care, respect and reverence for the deceased. Two separate on-site kitchens are offered for your convenience. Complimentary coffee is served at all hours. 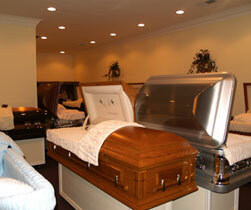 Our friendly and professional staff is here to answer any questions you may have about our Funeral Home services. We are available 24 hours a day, 7 days a week for emergency services. Contact Medford-Peden Funeral Home & Crematory today at (770) 427-8447 or browse our website for more information regarding our Burial and Cremation Services.